In my departing blog post for the LADOT Bike Blog/LeapLA, I thought I would reflect on my path in transportation planning and the changes I’ve seen in Los Angeles in such a short time. During my first year of Urban and Regional Planning school, I had the good fortune of taking a Policy Analysis class where I chose to do an analysis of corridor development on Eagle Rock Boulevard. Eagle Rock was the closest arterial street to my home, and a very wide street- an old yellow car right-of-way that had many different characteristics as you progressed through its different neighborhoods. Despite some improvements like street medians and bike lanes, Eagle Rock Bl. still seemed very inhospitable to people, so I wanted to see what factors contributed to this condition. My analysis led me into the realm of street configuration and its relationship to community character and user behavior. Researching human behavior around transportation was extremely captivating. Why did people jaywalk when it was clearly dangerous? Why didn’t people use the bike lanes that were built to help them? How does all of this effect the economic development and user vitality of a street? It was here I started my journey into understanding streets, neighborhoods, and people. A year later I found myself interning in the Pedestrian Program, a new division in LADOT born out of community neighborhood planning. In the Pedestrian program, my work mainly consisted of building the basis for a new program, Streets for People, later branded as People St. Soon I transitioned into a position in the Bike Program, where I began to develop programs based around business outreach and community collaboration. I worked on building partnerships between community members and the City, to bring placemaking infrastructure like bicycle corrals to City streets. Working with local non-profit organizations and educational institutions, I established a steering committee to pilot a Bicycle Friendly Business District in Northeast LA. This pilot grew into a broader program that would incorporate bicycle and pedestrian friendly infrastructure and programming, supporting Angelenos to embrace a lifestyle of localism, walking, and biking. One of the biggest proponents of this program was not the components of the program itself, but the sheer necessity: Los Angeles data confirms that 47% of trips in the county are less than 3 miles, and therefore easily achieved by any number of combinations of walking, biking, and transit. By fostering a culture to shift these trips away from the single occupancy vehicle, our city could build culture and community cohesion, while solving the decades long problem of traffic and congestion. In the almost 4 years since I came to LADOT, I’ve seen dramatic changes in Los Angeles. 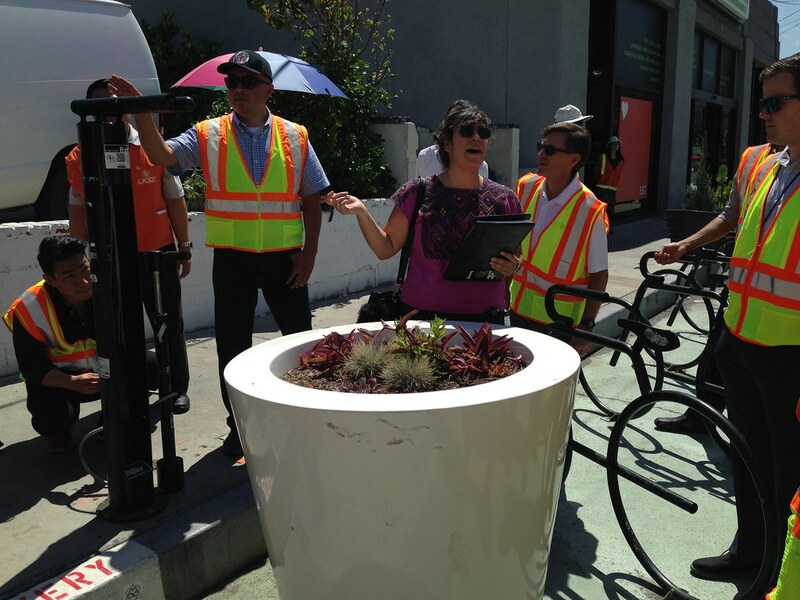 With the help and collaboration of many brilliant colleagues, I installed 14 bicycle corrals, 9 bicycle repair stations, 3 parklets, secured grant funding for 10 bicycle friendly business districts, and worked with hundreds of community members to make Los Angeles a more liveable place. 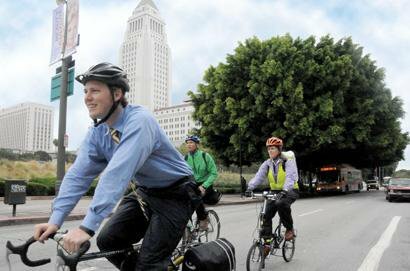 As I transition to a role in the Department of City Planning, I will miss editing the LADOT Bike Blog (now #LeapLA), and the opportunity to develop new Active Transportation projects. Today though, Active Transportation has progressed to a place where it is embedded in new improvements. In my last month at LADOT I saw the installation of our first fully constructed cycle track on Los Angeles Street, infrastructure we only dreamed of 4 years ago. I can’t wait to see what else Los Angeles has in store. One small step for the internet… One giant LEAP for the LADOT Bike Program! Stop the newsfeeds! Big news over here on the internet! After many months of planning, designing, and delving deep into the psyche of the bicyclela.org user, we are ready to LEAP into the future with a whole new approach to the LADOT Bike Program internet experience: bike.lacity.org. We don’t want to brag too much, but the next time you take a look at our website, chances are, you will be impressed. Our brand new website is bigger, better, and easier to use than ever before! Not only has the website received a navigational and aesthetic makeover, bringing it straight into the middle-2010’s- we’ve also overhauled the LADOT Bike Blog! We’re very excited to announce #LeapLA, the new face of the Bike Blog that meets the broader active transportation demands of the times. Counters! How many bicycle racks, bicycle lanes, and commuters are in the city? #LeapLA, speaks to our larger calling: Life for Everyday Active People. Besides keeping Angelenos up to date and informed on current bicycle projects, news and events, #LeapLA serves as an information hub for all forms of active transportation in the City of Los Angeles. We want #LeapLA to focus on people and their quality of life, whether they are people on bicycles, people walking, people skating, rollerblading, and more. We know people in LA get around in all kinds of ways and that the more options there are, the better time we make and the better experience we have. /wp-content/uploads/2016/03/President-Obama-using-LeapLA.jpg 1823 3240 LADOT Bike Blog http://bike.lacity.org/wp-content/uploads/2015/04/tempBikeLogo2.jpg LADOT Bike Blog2016-03-30 15:08:182016-04-05 18:33:46One small step for the internet... One giant LEAP for the LADOT Bike Program!